Al-Qaida loyalists fighting the forces of Syrian President Bashar al-Assad have managed to seize control of large parts of the country – and their influence is increasingly being felt in Kurdish areas of northern Syria. In recent days, many thousands of Syrian Kurds, seeking to escape persecution at the hands of Jihadists, have been crossing the border into the autonomous Kurdish area of northern Iraq. Last year, Syrian forces pulled out of most of the Kurdish regions, with the army concentrating on defending its position in the center and south of the country, where Syria's principal cities are located. But into that vacuum rushed Islamist forces, seeking to build a contiguous territory with fellow Islamists in Iraq. Kurdish fighters have been battling the Islamists, most of them members of Al Qaeda-affiliated groups, and ordinary Kurds have been caught up in the fighting. The Kurdish People's Protection Unit (YPG) has been involved in fierce fighting with Al Qaeda-linked Islamist groups such as Al Nusra and the Islamic State of Iraq and al-Sham (ISIS) over control of Kurdish-majority regions in northern Syria. Not long after the start of the uprising against the Assad regime, government forces pulled out of Kurdish areas, and the YPG moved in to take control. 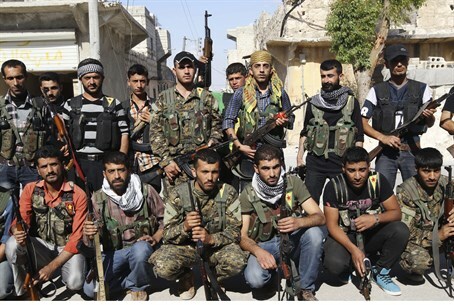 Arab groups within the rebel Free Syrian Army (FSA) initially made a grab for Kurdish areas but were beaten back. In recent months, however, Al Nusra and ISIS have led a concerted and violent campaign to install their own independent "emirates," or Islamic mini-statelets in the region. That was met with fierce opposition by the YPG, who responded by ejecting Islamist forces from the town of Ras al-Ain among other areas. Since then, anti-Kurdish rhetoric has reached fever pitch among Arab Islamists, with some mosques issuing fatwas (religious decrees) encouraging the wholesale slaughter of Kurds. When they take control of an area, the Islamists often conduct what is essentially a pogrom against Kurds, looting and burning homes and businesses. Meanwhile, shipments of goods and produce into the area have all but ceased because of the fighting, with high inflation and food shortages resulting. So far, according to the UN, as many as 7,000 Kurdish refugees have crossed the border into Iraq, but Kurdish officials said the number was closer to 15,000. Hundreds more cross the border each day. Observers in Iraq who have heard increasingly desperate tales of woe say that the Islamist campaign sounds very much like an attempt at ethnic cleansing. There have been numerous reports of massacres by Islamists of Kurds. Last week, Masoud Barzani, president of the autonomous Kurdish Regional Government (KRG) in northern Iraq, issued a warning to jihadist groups in northern Syria. Calling on Kurdish parties in Iraq to launch an investigation into alleged massacres by Islamists against Syria's Kurdish population, Barzani warned that if such reports were found to be true, the KRG would intervene directly to defend their Kurdish brethren. His calls are significant as they may signal an increased willingness by rival Kurdish groups to unite against Arab and Islamist terrorist groups in Syria, analysts said. The Kurds are the largest indigenous Middle Eastern nation without a state. Their homeland, Kurdistan, is currently occupied by Turkey, Syria, Iran and Iraq, although Kurds in Iraq enjoy autonomy under the KRG, with their own police force and armed forces (known as peshmerga). Kurds in Syria make up around 10% of the population, and are concentrated largely in the north of the country..